DayClips offers a comprehensive real-time online appointment system that facilitates appointment scheduling directly from your website. All you do is paste the scheduling link or your menu of services provided by DayClips into your website. With DayClips, you can also customize your own image to link with real-time scheduling. 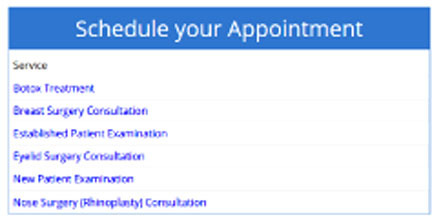 Real-time appointment scheduling from your website can be a huge improvement for your office. DayClips offers a superior appointment scheduling system to manage your time and maximize the effectiveness of your website.